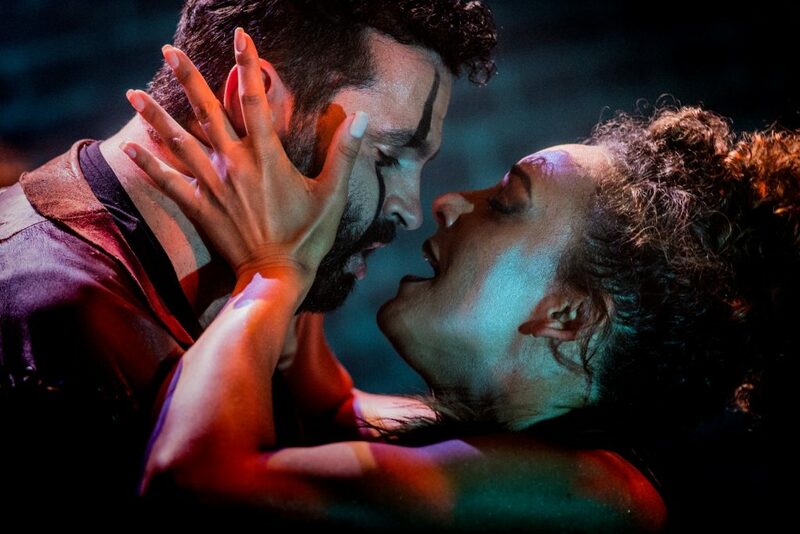 Aylin Bozok’s adaptation of Samson and Delilah takes centre stage at this year’s Grimeborn season at the award-winning Arcola Theatre in East London. 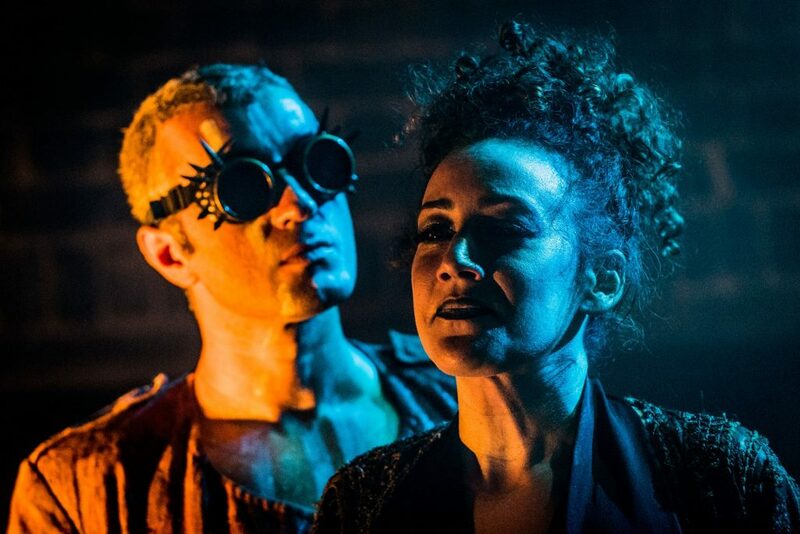 Dalston’s Grimeborn Festival is back for its eleventh year, presenting brand new alternative pieces to classical opera and I finally had the chance to visit one of this year’s programmes: a remarkable adaptation of Camille Saint-Saëns’ Samson and Delilah directed by Aylin Bozok. Bozok’s credits include The Intruder and The Bald Prima Donna (Arcola Theatre 2014), Suor Angelica (Talent Unlimited Festival 2014, St James’ Piccadilly), and Pelléas et Mélisande (Grimeborn Opera Festival 2013), the latter winning her the WhatsOnStage Award for Most Promising Newcomer. Her third Grimeborn outing is a rework of a biblical epic that adds to her reputation as a director who is unafraid of pushing the boundaries. In its original setting, this colossal drama portrays Samson, a Jewish hero, openly infatuated with Delilah, a beautiful Philistine woman. Yet Bozok’s production is as far removed as can be from the story’s previous classic representations, typified by Peter Paul Rubens’ famous seventeenth century painting of the couple. Those seeking such a classic rendition of Samson and Delilah may struggle to warm to the “surrealist environment far detached from any form of realism so it can be felt on a psychological level” that Bozok describes in her show notes, just as not everyone can like Salvador Dali. Yet, that doesn’t make their artistry any less valid. In fact, Bozok’s aim for her revival of this well-known opera is to bring a diverse point of view: not sociological, religious, or political, but rather a psychological one that makes you think outside the usual boundaries. It becomes an individual journey making us question love, trust and the mistakes we make. Can someone be purely good or bad? What is our default position? How do we cope with our conflicting emotions? The story becomes detached from its usual heroic, epic background and instead is taken into a world of impartiality and equality that lays bare both the good and bad in each character. Their competing thoughts are amplified in the stark theatre setting, which becomes darker as this psychological struggle intensifies. Even without understanding the French lyrics sung by the cast, or reading the English surtitles, the audience are swept away by the otherworldly atmosphere. The simple yet striking costumes, facial make-up, lighting, and smoke, together with a fine piano accompaniment performed brilliantly by Kelvin Lim collectively filled this minimalist stage that was devoid of any backdrops or props. Marianne Vidal shone as the femme fatale Delilah. Wearing a black cat-suit with plunging neckline, she oozed beauty and seduction as she strutted and writhed on stage, while also caressing and soothing her beloved Samson. Yet her dark vengeful side was never too far away. However, her over-fondling of a piece of fur (Samson’s hair?) nearly drove me to distraction. Her better half Samson was not your typical biblical hero – at least not in the Hollywood sense. Of average height and with a paunch, Leonel Pinheiro’s underwhelming physical presence as Samson emphasised the human frailties of his character, countered by his booming tenor voice that established his power. His inner turmoil over his love of God and sense of duty to his people, checked by his deep feelings for Delilah, came across as sincere and convincing. One of the more unusual characters in the play was a silent character who represented Samson’s vision of God, played masterfully by Ozgur Boz. Tall and exhibiting a golden aura (part light, part spray-tan), and sporting cropped hair, Steampunk spiky goggles and an unbuttoned floor-length tan coat that revealed his naked torso, he sauntered across the sparse floor deploying his divine powers. You know things are going to go badly for Samson when the High Priest removes God’s goggles (no hair cutting here). Samson’s blindness, both literal and spiritual, and his battle to overcome was matched by the audience’s efforts to keeping breathing in this airless and super-warm warehouse theatre space for 120-minutes (with thankfully two intervals), which inadvertently added to the surreal qualities of the play. 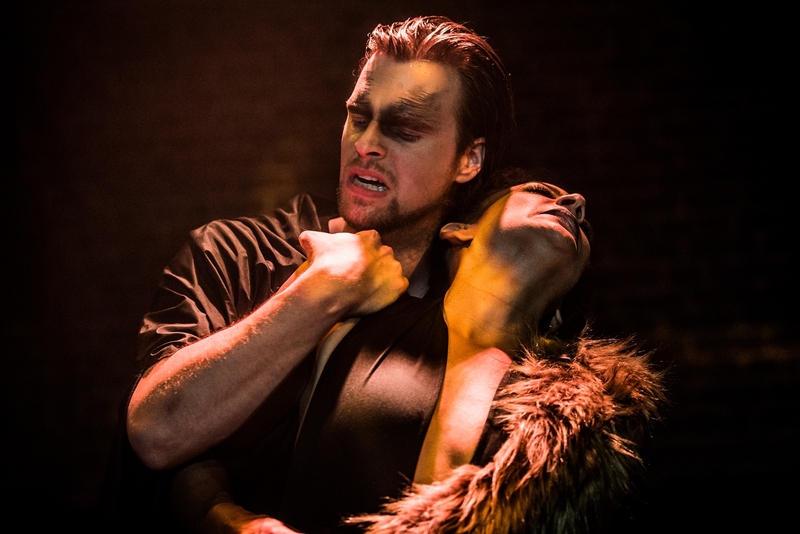 Grimeborn is certainly an interesting way to discover classic opera remade for the 21st century, and Bozok’s striking reinvention of Samson and Delilah is as unconventional as they come: it will remain with you long after you have seen it. 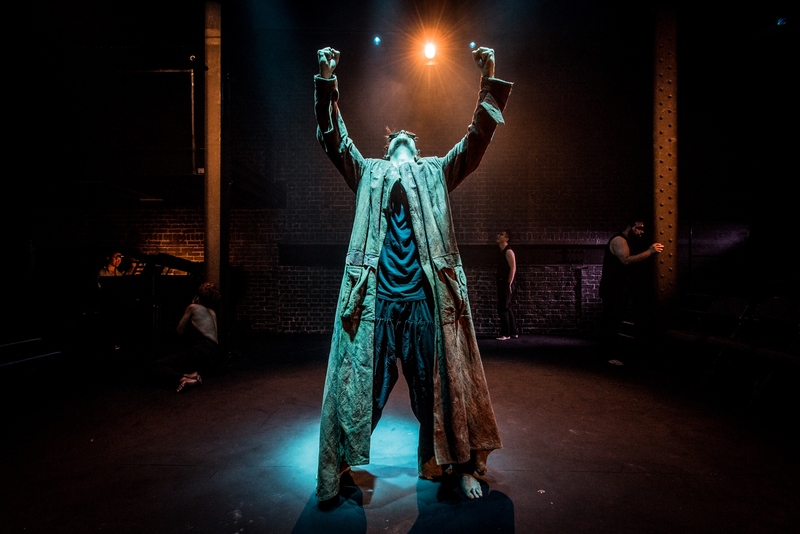 Samson and Delilah runs at the Arcola Theatre until 26 August. For more information and to book tickets visit arcolatheatre.com/samson-and-delilah.